Michael Noonan says he would like to share the burden of Anglo with its bondholders, but that the ECB wouldn’t support it. MICHAEL NOONAN has insisted that Fine Gael had never promised that it would unilaterally burn senior bondholders in Ireland’s banks – although the party is supportive of doing so. Speaking in the Dáil this afternoon, Noonan said that while he had always felt that the price of repairing the banking sector should be shared with private bondholders, this had never been a pre-election promise of Fine Gael’s. Instead, he said, he had always added the qualification that the support of the European Central Bank would be required if Ireland was to proceed with any plan which would see its banks opt out of repaying any of their bonds. Noonan was answering questions on the Irish Bank Resolution Corporation’s decision to honour a $1bn bond issued by Anglo Irish Bank - despite that bond not being covered under the terms of the government’s blanket guarantee. Donnelly had asked Noonan to elaborate on comments made in the Dáil last week, when Noonan recounted advice given by Brian Lenihan that the EU-IMF programme would be withdrawn if Ireland had decided not to honour the banks’ bonds. Donnelly accused Noonan of campaigning in the General Election on the basis that the banks would ‘burn’ their bondholders, even in spite of Lenihan’s insistence that doing so would put the EU-IMF deal at risk. “What you’re doing now is using information from Fianna Fáil, from last November, which you ignored during the election… you’re using that to justify what you’re saying,” he said. Earlier, Noonan had confirmed to Fianna Fáil’s Michael McGrath that the Financial Regulator had said it did not want powers allowing it to set mortgage interest rates on behalf of retail banks. The regulator was instead keen “to use the powers he has, along with his powers of persuasion – which are considerable – to affect the interest rate,” Noonan said. Email “Noonan: 'I never promised I'd burn senior bondholders'”. 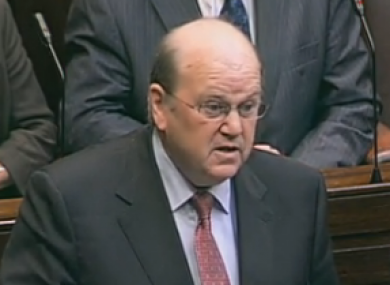 Feedback on “Noonan: 'I never promised I'd burn senior bondholders'”.